Irving, TX, Aug 20 – 2018: As the citizens of America are gearing up to celebrate this upcoming Labors Day, we are here with a grand announcement. 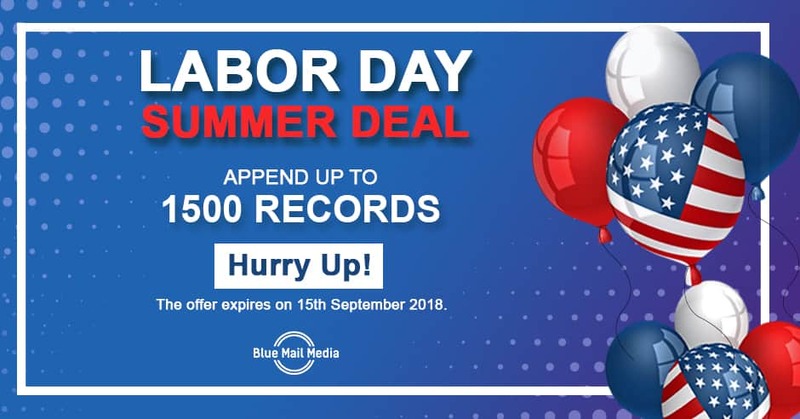 Every year on Labors day, Blue Mail Media presents the best offer on mailing list. Likewise, this year Blue Mail Media has come up with an amazing deal on all the lists. Check the dazzling offers which kick starts from 3rd September 2018 and expires on 15th September 2018. Hurry Up! Execute your marketing campaign successfully! Avail the Latest Offer Now ! What to Expect from Blue Mail Media? – Blue Mail Media’s data team updates all the records in the 60 – 90 days. – Once you request the list, it undergoes manual verification to strengthen the reliability. Hence, it takes 2 or 3 days to reach you. – All the lists enclose marketing information such as contact name, company, title, address, email, contact number, website address, and more. – With a high deliverability rate, the list helps you to connect with the new customers as well as retain the old ones. Blue Mail Media is a leading international provider of email marketing solutions. It also offers customized marketing data according to industry type, geographic regions, market requirements and more. Blue Mail Media’s repository has highly authentic and also updated contact details of key decision makers of industries across the world. Hence partner with them to reach the most precise prospects relevantly.